May 25-26, 2012 | Friday, 7-9 p.m. & Saturday, 9 a.m. - 3 p.m.
Dr. Jim Berg is a member of the seminary faculty of Bob Jones University where he teaches and prepares seminars and online counseling resources for pastors after having served as dean of students for 29 years. Mrs. Pat Berg also serves as a faculty member at Bob Jones University where, she teaches women's classes in Bible and counseling. 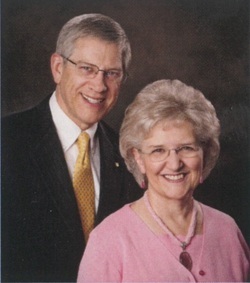 In addition to their responsibilities at BJU, Jim and Pat speak at couples conferences and retreats in churches and camps across America. They have three married daughters and a growing family of grandchildren. The seminar will be held at the Creation and Earth History Museum, 10946 Woodside Ave. North, Santee, CA 92071. The cost of the seminar is $45 per couple–-includes seminar, class materials, and refreshments. Please RSVP by Friday, May 18 by calling (888) 252-6363.